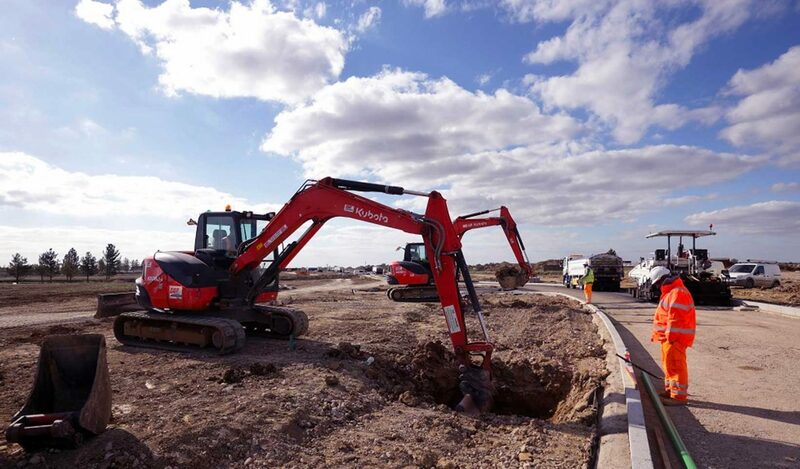 Urban & Civic are getting ready to start the early infrastructure work and site set-up which will support the Wintringham development to come forward. Local contractors Breheny will be on site this week carrying out site set-up and some testing in advance of the start of works. putting in an entrance, as an additional arm from the Dramsell Rise/Cambridge Road roundabout. This will involve works on site, connection work to the roundabout, and removal of some of the hedging in this area to enable this. This entrance will support a site office for the U&C team and early contractors, as we start to take forward development. putting in an entrance off the Stone Hill/Cambridge Road roundabout. improving and reinforcing an existing farm access, to the east of Stone Hill roundabout, as the initial access point for construction traffic. This entrance forms part of the early works construction traffic management plan, which has been designed to minimise impact on local roads and ensure a safe access. The entrance has been designed to be turn left in, when coming from the A428, and on leaving the site, to turn left, to go around the Stone Hill roundabout and back along Cambridge Road. Under the plan, traffic during peak hours is minimal, and the majority of the works will be happening on site. Any work involving the road network will be agreed with the transport authorities and advertised in advance through signage and on this website. Access to Loves Farm will of course be maintained at all times.